Sacramento sends cyclists a clear sign that it’s okay to hitch your bike to a parking meter. 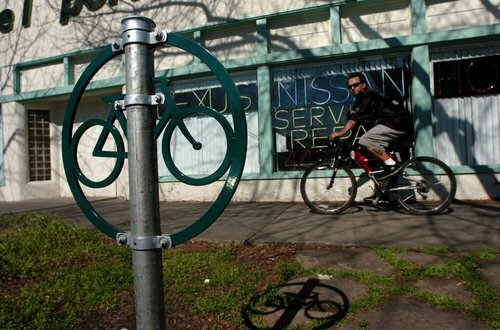 The City of Sacramento is converting defunct parking meters into officially sanctioned bike racks, the Sacramento Bee reported last month. After replacing its traditional meters with solar-powered, Muni-style pay stations, the city came up with this nifty purpose for otherwise useless infrastructure. One hundred meters have been converted so far. If successful, the city will give more old meters the bike rack treatment. This is a great idea, but we have to ask: Why not outfit active meters with bike racks too? Is it that inconvenient for drivers to reach over a bike while they feed the meter? Great idea. But I wonder if those bolts are secure enough. In the photo it looks like the bolts could be easily removed and the bikes can be slipped off with ease.